Hora de la Cena…Dinner Time! It’s no secret that I absolutely love Mexican food, Mexican and Japanese are far and away my favourites. 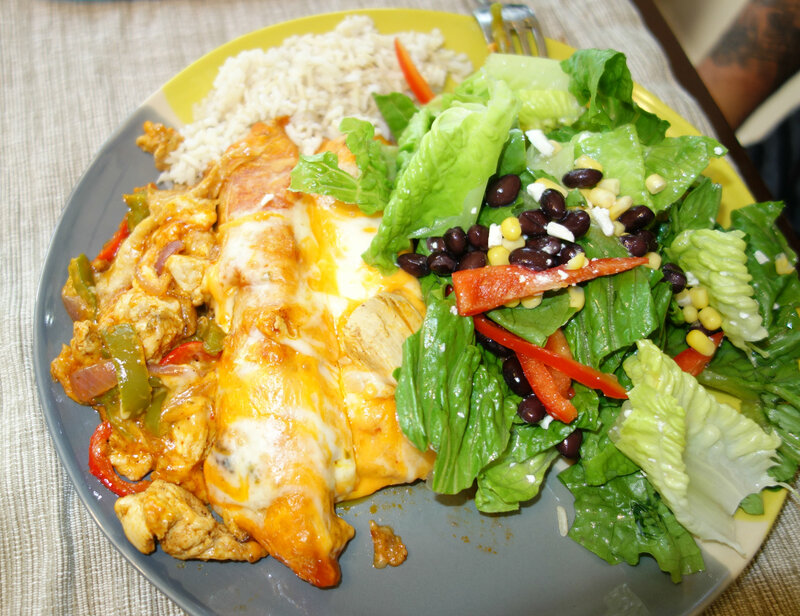 I’m always looking for ways to take Mexican dishes and health them up and this enchilada is always a crowd favourite around here. My Uncle David was visiting from Toronto so I thought it would be a good dish to whip up. So start by cutting up your chicken breasts into chunks about half to three quarters of an inch. Put the olive oil in a wok, heat it briefly and add the chicken. Brown it over medium heat. 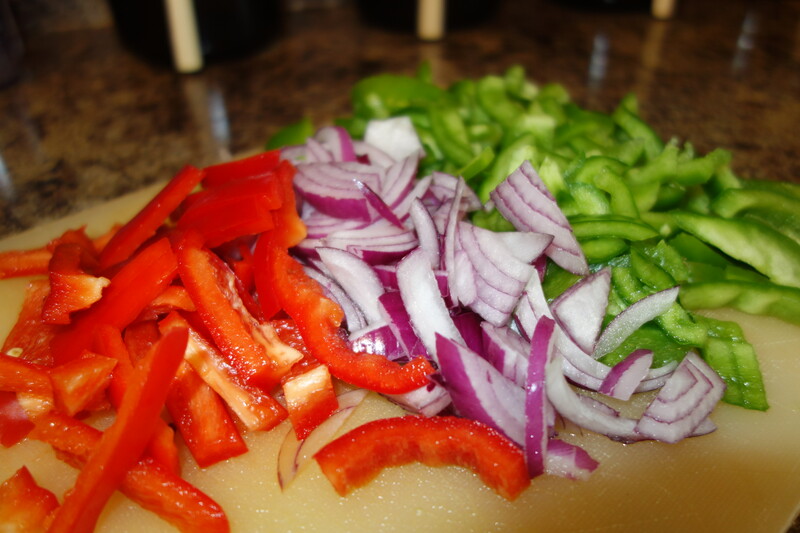 While it begins to brown start chopping up your vegetables, I used 2 green peppers and one red pepper, as well as one small red onion. Normally I would add black beans but my husband doesn’t like them (crazy, I know) so I served them on the side. When you notice you chicken is beginning to brown, the taco seasoning comes into play. 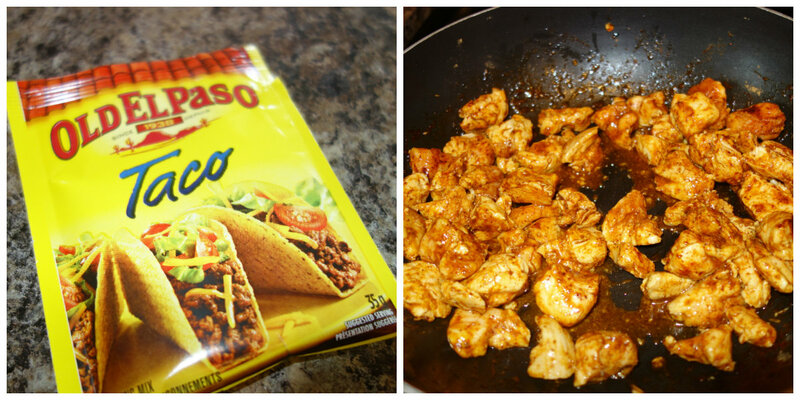 You can get it at any grocery store, and I put just under half the package on the chicken as it was cooking. That was for the 3 breasts I used in total. 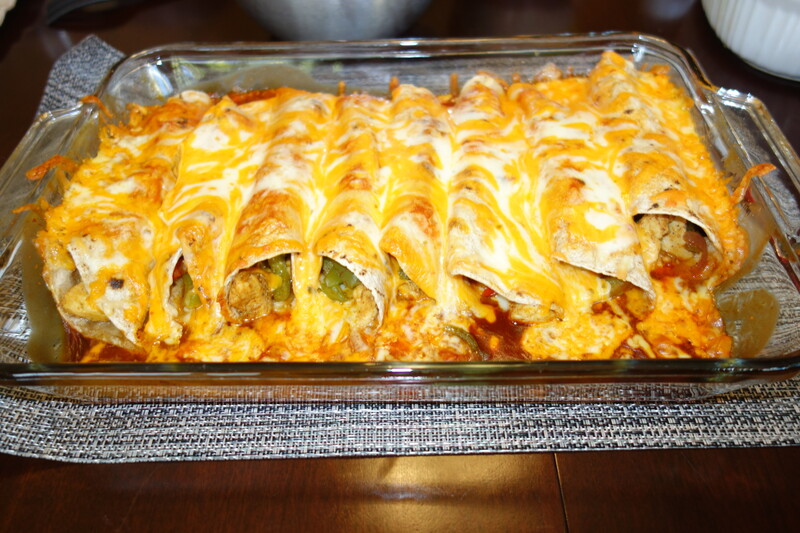 This food was for 3, but we had leftovers so this recipe is probably perfect for 4 people. Let it sautee for about 5 minutes, then add the vegetables to your wok. I continued to sautee it all for about 15 minutes over medium low heat, stirring every 3 minutes (ish). During this time I cooked some brown rice to serve with the enchiladas. The other thing you can do during this time is preheat your oven to 350 and get your dish ready, I used a 9 by 13 pyrex glass dish. 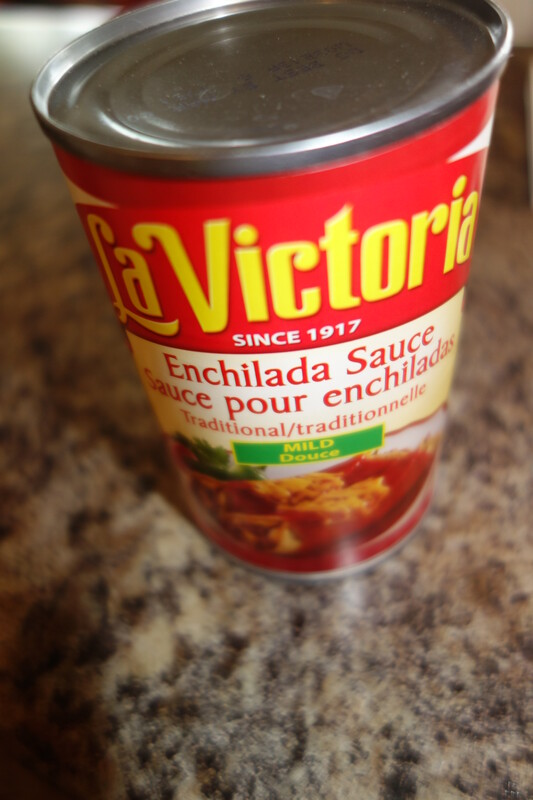 Take your enchilada sauce (I used about half the can) and spread it all over the bottom of the dish. You’re going to lay out your tortilla and spoon the chicken and vegetable mixture down the middle. Leave a little room on each end so when you roll you don’t have to worry about the filling spilling out. Sprinkle with a little bit of the tex mex cheese blend. Now comes the hard part, the rolling. But it’s not really that hard! So roll up the tortilla, just like a cigar. The first one you put in you have to tuck the top edge against the edge of the pan so it doesn’t fall open. The following roll ups can be tucked against the one before. This size dish fits 8 exactly, but you have to use the smaller tortillas. You know when you’re at the grocery store and there are usually two sizes? Choose the smaller one. 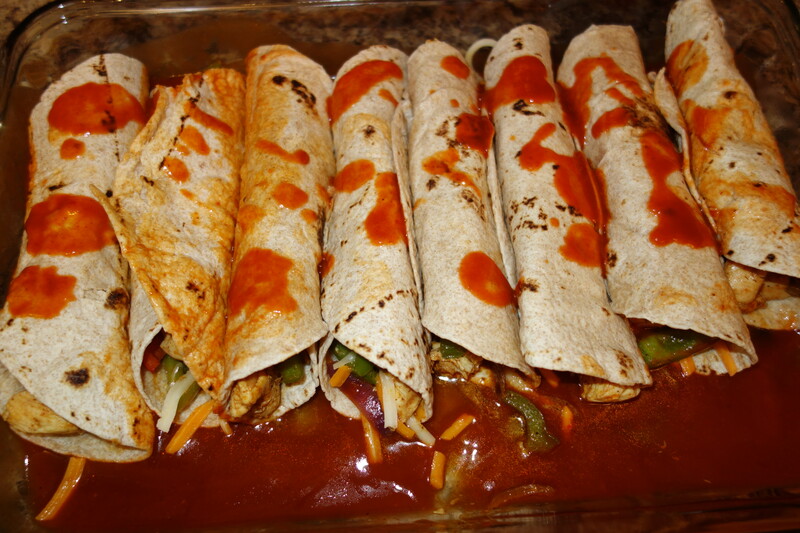 Once all 8 enchiladas (in the making) were placed I drizzled some more of the enchilada sauce on them all. 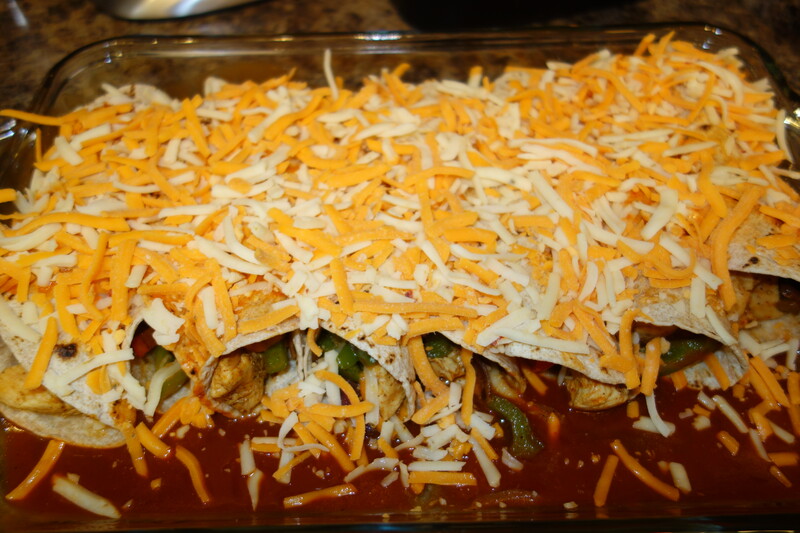 I then sprinkled more of the tex mex cheese blend on top of everything. I covered the dish with aluminum foil and baked for 20 minutes at 350. After 20 minutes I uncovered and baked for 5 more minutes to melt the cheese. That’s it! So easy and sooooo delicious! You’ll need a strong spatula because the torilla can stick to the bottom of the pan a bit when baking. 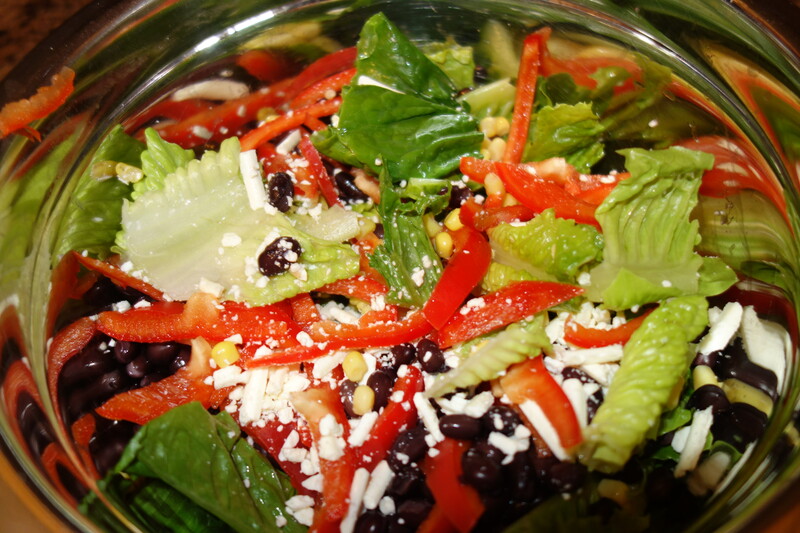 I served them with a salad that had romaine, black beans, corn, feta cheese and red peppers. I used straight balsamic vinegar because I don’t really like salad dressing but I found this Chili Lime Dressing online that sounds tasty and seems really easy to make. I also served it with brown rice and chips with salsa. Another fiesta in this joint! I made strawberry shortcake for dessert which is totally not Mexican but still yummy. Next time I’ll search out a Mexican dessert to trial and report back. The dinner was very well recieved and we had a great night full of conversation, mexican food and so much wine! Have fun with this recipe and mix up your veggies to whatever your family likes. Good Luck!